I greatly enjoyed the Jupiter small bore challenge thread. With Saturn's opposition coming up I thought there should be one for Saturn as well. I don't yet have an image to offer myself, but I would like to see what is possible with a 6 inch or smaller scope. Thanks. Good idea, Jason - I thought about starting this too. I'm really interested in what other people with similar scopes to mine (Celestron Nexstar 6SE) are getting. Saturn is really tough at my latitude (47.6°N), and most nights it's not worth trying: if I can't easily observe the Cassini division, I don't bother with the camera. 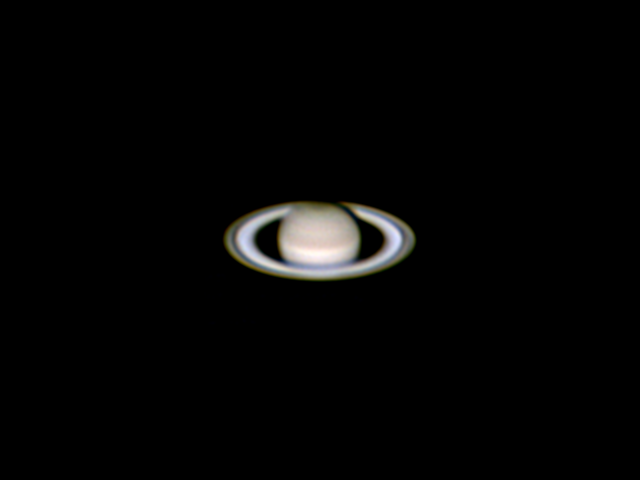 I posted this on its own thread recently, but this is my best Saturn so far, from April 17. Its altitude was just 23.5°. Three processed images combined in WinJUPOS. The three avis had around 3000 frames, and about 35% of each were stacked in AS!2 before processing in Registax and Photoshop (colour balance). Used a Neximage 5 camera with 2x Barlow. Great job Ray. 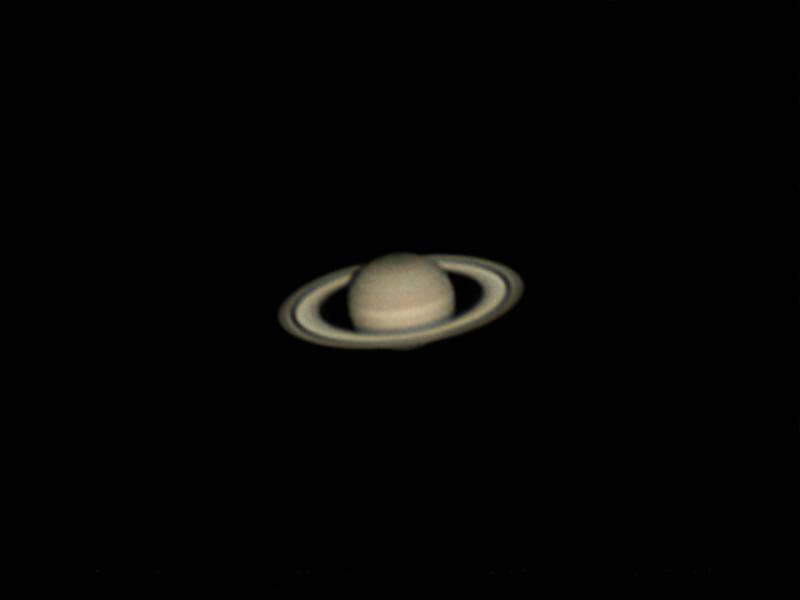 I have a Celestron Omni XLT 6" reflector and I can see the Cassini division but I can't distinguish different colors on the planet (so far). I know your long focal length helps. Keep up the good work. This is what I was hoping to see in this post. I can understand great images coming from big scopes but what really impresses is someone pushing their equipment to the max creating images that look like they were taken through a scope twice the size. Yours is a perfect example! Here's one from April 29th using a William Optics FLT 110. If memory serves me right, this was a 4 minute capture utilizing a Skyris 618c camera and 4x Powermate, stacked and wavelets in Registax, then color balanced in Adobe Lightroom. But I think I messed up the color. I may give Saturn another shot tonight if the clouds hold off. Thanks, Jason. Observing visually, I can see the bright equatorial belt and that the planet is yellower than the rings, but that's about it for colours. I was pretty happy that this photo gave at least some hints of banding and subtle colour differences in the northern hemisphere, including a dark polar patch that I assume is the hexagon. Terry: you seem to have captured a similar amount of detail as I did. For colour, coming out of Registax, my images are all bright yellow. In Photoshop, I apply "Auto Levels", which I usually have to fade a bit (40-50%) as it increases the contrast too much (burns out the bright belt), and then try just "Auto Color". 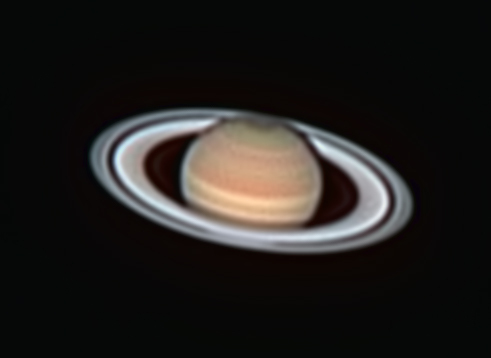 Sometimes I have to select just the planet and rings for this, using an oval selection shape - including a lot of the "black" background can throw the auto colours off sometimes. I then usually add in a little more yellow in the colour balance to get something closer to the pastel colours I've seen in "natural colour" photos from the Cassini probe. Not sure if the same process is possible in Lightroom or not. I'm going to look into getting photoshop very soon. It looks like it's pretty essential in bringing out the detail and correct color. Thanks! Edited by TerryWood, 04 May 2015 - 10:51 PM. 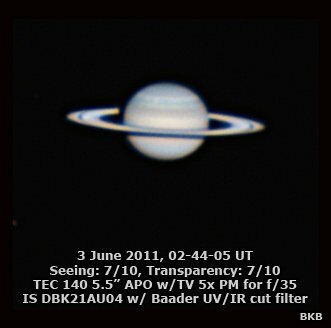 I have not imaged Saturn yet this year, but here is an image from last year's apparition obtained on June 14th, 2014 as my small bore submission. This was obtained with a TEC 140 and ASI120MC at f/25. 2200 frames stacked in Autostakkert2, sharpened in Registax 6 and finished in Photoshop. Edited by BKBrown, 05 May 2015 - 08:52 PM. Brian: great to see some surface detail in your images. Part of the fun of trying Saturn is that it is such a challenge with a small instrument. I've been slowly getting better images over the last few months, and I'm still interested in seeing how much more I can squeeze out of my very limited setup. While Kokatha's images are breathtaking, seeing them doesn't reduce the enjoyment I get out of creating my own images. Anyway, imaging Saturn now is going to provide us with excellent preparation for October's small bore Uranus challenge! This is from July 27, 2013. Captured 10fps for 8 minutes at F/15. Best 60% stacked in AS!2 and wavelets applied in Registax 6. NexImage 5 cam. 70mm achromat. 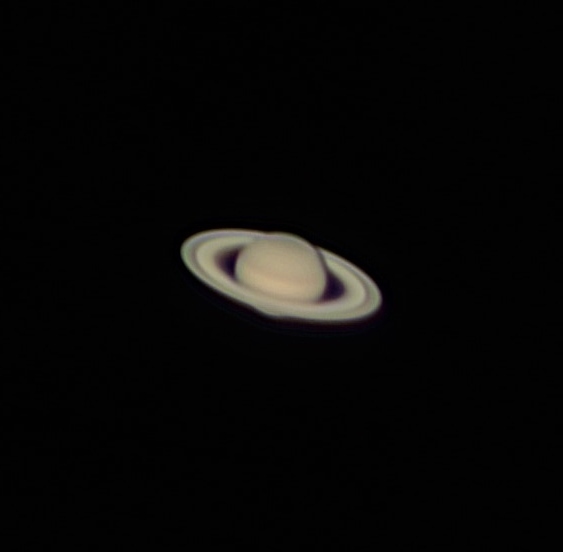 Saturn last night from the Deerlick Astronomy Village, Esprit 120 Triplet APO, Televue 5x barlow. 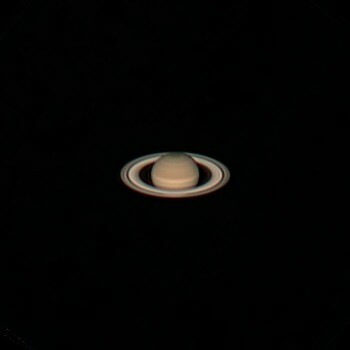 I do not have a pic of Saturn this year yet, but here is an image from June 28th 2014. Shot with my cell phone through Lunt 152ED refractor. 6mm Radian/2x barlow (400x) 2 min. video @ 24fps. Converted to AVI and processed with RegiStax 6. 1000 frames stacked, RGB align, wavelets. 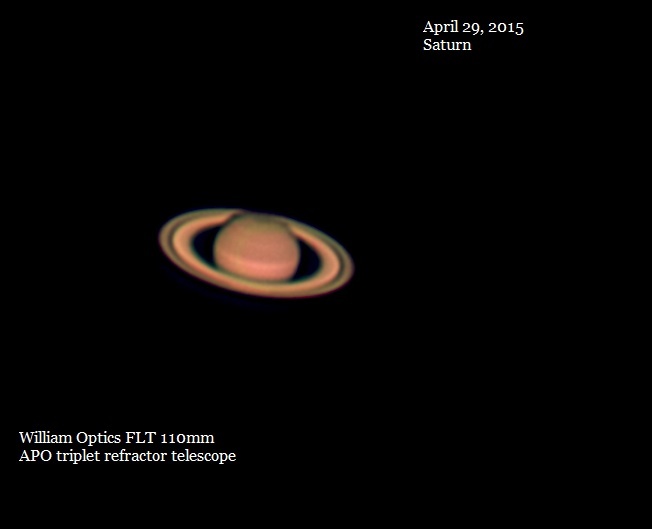 Here is something from April 17, 2015 using a Tele Vue NP127is with a 4X Powermate and an ASI120MC camera. So, I went back and tweaked the channel alignments and exposure levels and increased the image scale and I got this new version of my previous post on Saturn with my NP127is (captured on April 17, 2015 with an ASI120MC). Edited by james7ca, 12 May 2015 - 07:58 PM. How can i resist posting the very last image from last appartion? There are some enviable images being posted here. From Seattle, Saturn now reaches 23.9° when at transit, and seeing can never be considered "good", yet I haven't given up trying since it isn't going to get better than this for several years. For these images from May 9 (with Celestron Nexstar 6SE with 2x Barlow and Neximage 5 camera), I increased my recording time to around 5 minutes/video and got a slightly higher frame rate than before (21 frames/s) by increasing gain somewhat. Seeing wasn't as good as it was for my image of April 17 above, but the rings look nicer here and overall I don't think it's any worse. This is the first time I managed to keep a little of the C ring after stretching histograms in Registax. Here is the same image with colour saturation cranked up, which shows that somewhere in the mush of my avi frames there is a least a little information on the planet's more subtle bands. Edited by KiwiRay, 11 May 2015 - 12:09 PM. 5" Dobsonian reflector, 1200 frames captured with Logitech Quickcam Pro 4000 through 2x Barlow. Question for the experts here. 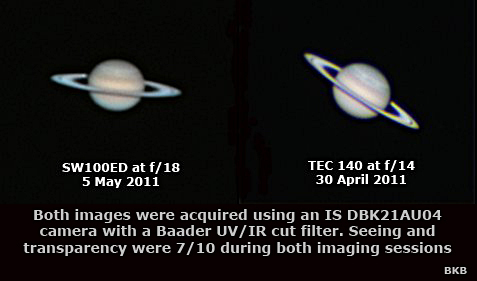 I'm skeptical of 5X barlows (though some of the images here could change that), but I seem to be able to get plenty of light onto the CCD sensor for planetary images. If I were to increase magnification (either by using a higher power barlow or stacking on another 2X) would I end up with a net loss or gain in detail? There is this rule of thumb for Barlows which says the focal ratio should be 5 times the pixel size in microns. I've noticed that people get good results when going up to 7 times the pixel size in microns (or more?). Once you have a desired focal ratio the Barlow to get will depend on the telescope focal ratio. So if I understand this correctly (and math was never my strong suit), stacking a 3X barlow with my 2X theoretically should be fine given my camera's pixel size of 5.6μm and scope's f-ratio of 5. That looks about right to me. Of course the actual size increase you get from a Barlow depends on spacing. My 2X Barlow actually gives me around a 2.3X size increase. Edited by WarmWeatherGuy, 12 May 2015 - 01:42 PM.